Adding ceramic countertops to the home is an idea that is gaining in popularity with homeowners across the nation. These countertops are very strong and are priced competitively to be affordable to many of the homeowners that are considering purchasing a new countertop for their home. It is important that the ceramic countertop is cared for properly to keep the countertop looking new and to protect it from damaging elements. Ceramic tile countertops are the most commonly purchased type of ceramic countertop because of their affordability and the minimal amount of maintenance required to keep the countertop in top form. 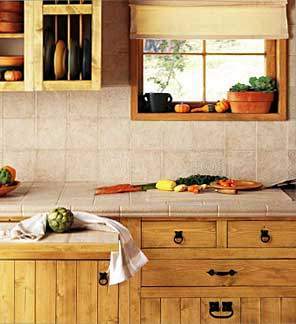 Ceramic tile countertops are heat resistant, stain resistant, and cannot be easily damaged by sharp items. Although the countertops can be scratched, it is generally only the surface of the sealant layer on the countertop that becomes damaged and this can be repaired by either buffing the damaged area or removing the sealant layer and resealing the countertop with a new layer of sealant. Ceramic tile countertops are porous, so if water or another liquid penetrates the sealant and reaches the tiles beneath it could cause a number of different problems. If the liquid is colored, then it could stain the tile with whatever color is present in the liquid and removing these types of stains can be very difficult, even with the proper cleaning solution. Liquids penetrating through to the tile of the countertop can also result in the growth of mold and bacteria inside of the tiles, which can also cause staining and can be very difficult to remove from the tile without damaging the countertop. Staining and mold growth on the ceramic tile countertop can be avoided by cleaning the countertop properly after every use. Any liquids that are spilled on the countertop should be mopped up immediately with a damp cloth or sponge so that there is little chance of the liquid damaging the countertop. The countertop should be cleaned on a regular basis using a combination of soap and water to remove any food particles or dirt from the surface of the countertop. Attention should be paid to removing any food particles or puddles of liquid from the grout joints that are present in a ceramic tile countertop because these are the areas that are most often missed when items are hastily wiped from the surface of the countertop. Each line of the grouted joints should be gone over carefully with a soapy sponge or cloth to make sure that no items remain that could cause the growth of harmful bacteria or mold in the joints of the countertop. If there are food items in the grouted joints that cannot be easily removed with the sponge, then the area can be lightly scrubbed with an old toothbrush dipped into a soap solution to loosen and remove the offending items. This will ensure that all of the areas of the countertop have been cleaned properly and prevent damage from occurring because of foods or liquids left on the surface of the ceramic tile countertop.